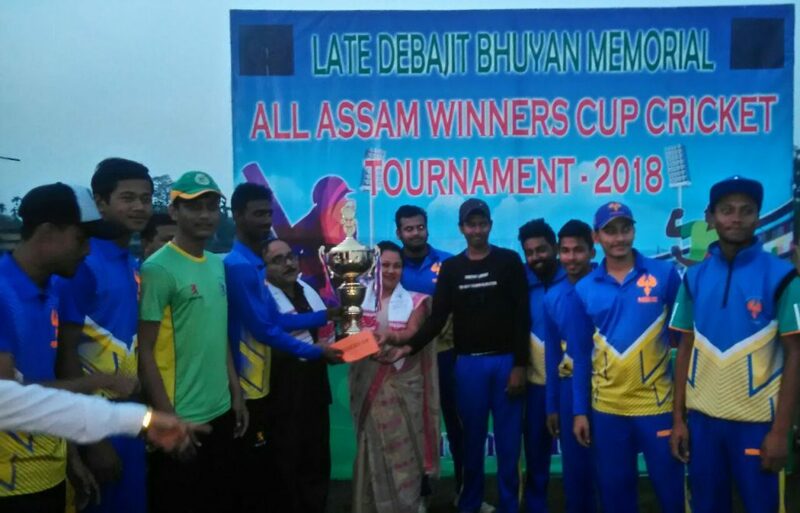 The Cricket Club of Dibrugarh emerged as the champions of the Debojit Bhuyan Memorial All Assam Winners Cup Cricket Championship held at the industrial town of Namrup in Eastern Assam’s Dibrugarh district. Cricket Club of Dibrugarh beat Sivasagar Phinixue Club by 17 runs in the exciting final played at the Namrup Gandhi Maidan on Tuesday. The cricket tournament was organized by Nautilus Club of Namrup. Cricket Club of Dibrugarh won the toss in the final and elected to bat first. The Cricket Club of Dibrugarh scored 126 run losing eight wickets in their stipulated 30 overs. Chasing a modest total, Sivasagar Phinixue Club lost all their wickets with just 110 runs on the board with four overs to spare. Sandip Sarma from Cricket Club of Dibrugarh was adjudged the Man of the Match. The prizes were given away by Brahmaputra Valley Fertilizer Corporation Limited (BVFCL) Chief Administrative Officer Pranab Kumar Bhattacharjee, Namrup Town Committee chairman Neetu Sonowal Buragohain and Naharkatia Cricket Union secretary Satish Agarwalla.